I've never done this before, but I was looking back at some past blog posts and ran across this one that I wrote last summer when we left Russia. This time of life is what has prompted me to return to Ruth over and over again. So I thought I would simply re-post that blog. Ruth, my favorite book in the Bible. It speaks to me every time I read it. Ruth, the woman, inspires me. She gives me passion and desire to seek God with all my heart. But right now I am in a dry time. A very dark and dry time. 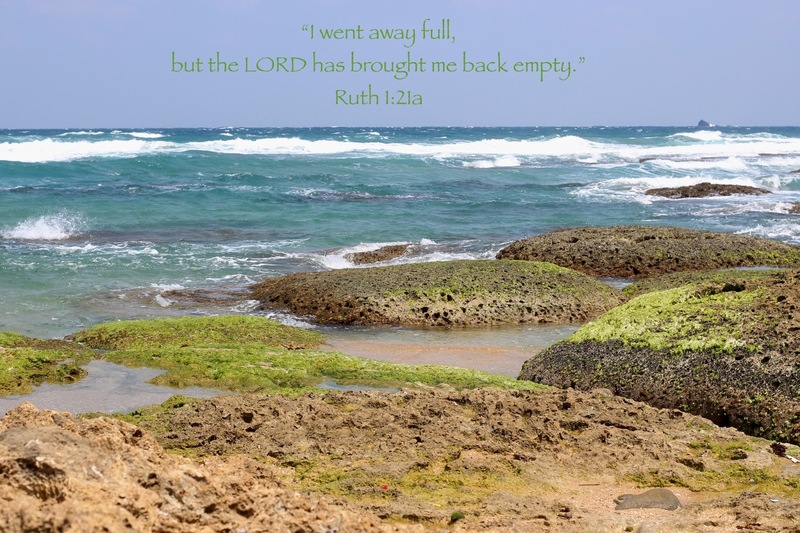 A few weeks ago I felt the need to sit down and reconnect with Ruth, but nothing. I read it and just felt dead. This morning Chad and I got up at 5:45 took quick showers, and ran around the apartment like crazy, stuffing last minute things into suitcases and running the last errands to friends quiet doorsteps, dropping off bags of unused food. The van pulled up to the front door precisely at 6:30, we loaded everything in and slowly drove out of the embassy. One last look back at the row of apartments with potted geraniums trying desperately to brighten the worn buildings. Despite the dead feeling of the facades, all I could think of were my precious friends tucked inside, just beginning to stir for the day. It hurts so much to say goodbye. The van turned the corner around the marine house and everything disappeared from sight. I felt numb as we waited for the first gate to roll open. We pulled into the check area as the gate slid closed behind us. The sound of the metal locking tight made me feel like a sad lion in a zoo, trapped behind bars holding him captive. All the life sucked out, he has nothing left to give. A moment later the front gate began to roll open, the wheels squeaking out a sigh of relief. We pulled forward. One last time to catch the Russian guards giving us a hard stare. The Seven Sisters building that I looked at every morning and evening for two years still stood tall and proud, unmovable as she will be for centuries to come. We drove on the quiet streets of Moscow, past the mint green train station trimmed in white. Chad pulled out his phone to take one last photo. We were both struck by its stately beauty. I will miss it so much. The graceful neoclassic buildings in the center of town began to morph into Stalin monstrosities as we drove towards the airport. And now I find myself on a plane, streaming though the sky to Washington D.C. I've spent most the time with my forehead resting against the window, staring down. The large city of Moscow quickly became a small spot in the distance then disappeared into nothing. The mountains of Sweden were covered in snow. The air was so clear I could count the blade on windmills as we passed over at 30,000 feet. The bareness of Iceland felt like my friend. Icebergs floated in the water off the northern coast of Canada and now the plane is wrapped in a blanket of clouds. I watched a sad movie. A little feeling crept into my soul and a tear slipped down my cheek. I heard a voice say "Read Ruth." Why not? I have hours to go and maybe this time I'll find a little speck to cling to. Today Naomi is my friend. I want to sit with her in the barren land and mourn together. In my ten hour flight I feel the numbness and aloneness that she must have felt on that long walk from Moab to Bethlehem. She went to Moab years earlier with a family, full of hope and purpose and she returned with everything drained from her. She had given all she had to the land and her family and now she had nothing left to give. My situation is not exactly the same as Naomi's, but I feel some parallels. When we move to Taipei in a few weeks, we will leave one more child behind to attend college. She is so ready. She has grown into this beautiful and competent young lady who is ready to define her own life. This is what I raised her to be. It is right and it is good, yet a part of me wants to keep her by my side forever. Loneliness and loss. I get the feeling that Naomi built a good life for herself in the land of Moab. I don't think that she was drained and empty from day one, but as situations happened, they sucked the life out of her. So when she returned to Bethlehem, she came back wounded and empty. No ability to be a life giver to those around her as she had in the past. I loved my time in Moscow. I loved the city, the museums, the onion domes and the church bells. I loved my friends, eating together, exercising together, working together and simply living together on a compound. But the first year held many, many difficulties, from the move itself and all the mold it presented, to the stress of the Olympics and the Ukraine tension and finally the death of an embassy member whom my husband took care of until the moment she passed. The year wiped us out and we never quiet regained our momentum. Enough little puffs of wind came our way that in our weariness we blew over like a house made of cards. You would think great traumas happened, they didn't. We just weren't able to handle the small things that did happen. So this second year we have been functioning more like robots, trying to enjoy life with full engagement, but simply unable to. So that's where I am. I feel like the Lord is bringing me back empty. It's not a summer where I will be running around, visiting everyone and filling my time with happy reunions. I'm looking forward to seeing people, sharing meals and enjoying nature, but they will be quieter moments with those I trust greatly. I hope this will be a summer of rest. A time I can restore, like Naomi eventually did.